Bransy is a liquor, or spirit, made of wine grapes. Spirits or liquor, such as scotch or bourbon, are made from grains and distilled. Wine, by contrast, is the product of fermented grapes. Fortunately for the world at large, exists a beverage that is a fine mixture of the two processes: brandy. The name is short for 'brandywine' and even the sound ('burned wine') suggests what it is and how it's made. The specific grapes used, not surprisingly, have a large influence on the final product. Everything from the Ugni Blanc to pomace or sherry grapes might form the base. 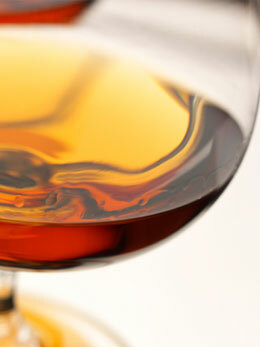 The first are grown in the Cognac region from which that type of brandy gets its name. Pomace, by contrast, is produced from the pulp, seeds and stems that are left over after the juice has been extracted. The traditional Italian form of brandy, called Grappa, is made this way. Sherry is an anglicized word form of Jerez, the region in Spain that lends its name to the product of that country. This type uses grapes grown specifically for making that native brew. There are some brandies that don't use grapes at all, such as the slivovitz from Poland, which uses plums instead. But the name in the English-speaking world usually refers to the product made from grape juice. But whichever grape or grape component is used, the process is much the same, and much the same as making whiskey. Wine is fermented, producing anywhere from 8-12% ABV (alcohol by volume). To achieve the 30-40% of brandy, the liquid is heated in a still typically made of copper. The evaporate passes up where it ultimately condenses into another vessel. Because alcohol boils more readily than other liquids, the final result has a much higher concentration. The end product isn't merely more potent, though. Part of the process usually involves aging in casks, similar again to the way whiskey and other spirits are made. Pomace and fruit brandies are not aged at all. The specific type of cask and how it's prepared have a substantial impact on the final flavor. Oak is by far the most common choice of wood from which to make the aging barrels. The so-called single-barrel process produces a golden brown liquid whose taste can't be adequately described. It has to be experienced. The oak suffuses compounds into the wine at the surface, which gradually diffuse throughout the liquid inside. The result is a brew that is part wine, part spirit - and all divine. When the aging is halted at two years, the produce is an A.C. brandy. The V.S. (Very Special) designation is reserved for those aged at least three years. Only those aged five years receive the V.S.O.P. (Very Special Old Pale) label. For those who can afford the very finest, three more exist: the X.O. (Extra Old, aged at least six years), Vintage (stamped with the date first stored) and Hors d'Age, which have seen at least 10 years in the barrel. Fine grapes, careful distillation and superior aging techniques combine to produce the glorious nectar known the world over as brandy. But then, saying it doesn't prove the point quite like tasting it. As with wines, which brandy resembles, there is something of an art to judging this fine spirit. But, also like art, there is a range of ability, and there is an element of personal taste. That last should be considered for a moment. Note, that judging brandy isn't entirely a matter of personal taste. There are some guidelines for what qualifies as good or bad, in brandy as there are in art in general. Among finer brandies the differences can be subtle. But to notice those requires some practice and some experience. The nose, tongue and palate don't automatically recognize very small differences. They have to be trained or, more accurately, self-trained. The lessons can be hastened, though, by following a few simple guidelines. Before you even get to the stage of tasting the brandy, you have to prepare properly. That means starting with a very clean glass. Wash it thoroughly, then dry well. But ensure that the drying process doesn't introduce small cotton or paper fibers onto the rim or interior. Air drying is the surest way to avoid that problem. Then, pour a small amount (about 20-50 ml) of the brandy slowly into a brandy glass of the traditional shape. That shape is not just a marketing gimmick. It was designed that way for a purpose. It allows the aromas to waft up above the surface of the liquid and gather at the opening, from where they slowly escape. Before you inhale them, take a long look. Enjoy the color. It may be anything from a pale straw color to deep amber. Brandy is colored, but still quite transparent. Mentally record the color in order to compare to others. There's no 'best color' but it will be associated with certain flavors, so it's good to know which is which. Now inhale from a few inches away and try to separate the different aromatic hints. Tilt the glass and swirl a little bit to release more. Move your nose closer and take another whiff. Search out those aromas that will only be noticeable from this new distance. With experience you'll begin to be able to make finer and finer discriminations and to associate them later with flavors. There may be hints of the oak in which the brandy was aged. The longer it was aged, the deeper those aromas are likely to be. As with any tasting experience, consumption isn't the goal. In fact, if you swallow six different brandies in a short period of time, you're likely to be a little too woozy to judge anything subtle. So, start slow and follow the old rule of sip, swirl and spit. What that means is simply to take a small amount onto the tongue, then let the liquid travel across it in a little circle. Give the aromas time to spread up the sinuses as the taste hits different taste bud areas. The human tongue is more sensitive to different tastes in different areas. By the sights you sense through the eyes, the bouquet judged by your nose and the variety of flavors and textures perceived on the tongue a fine brandy reveals itself. Even among those brands that are first rate there are differences. Those, of course, are a matter of personal taste.